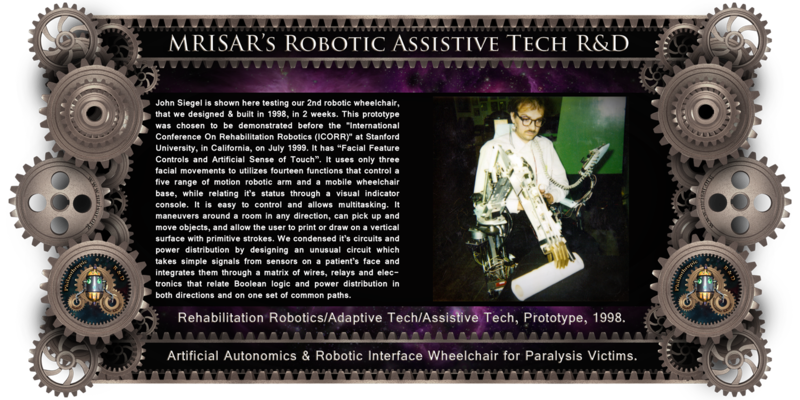 ​MRISAR’s Rehabilitation Robotics; Artificial Autonomics & Robotic Interface, For Paralysis Victims Designed & built in 1998, in 2 weeks. 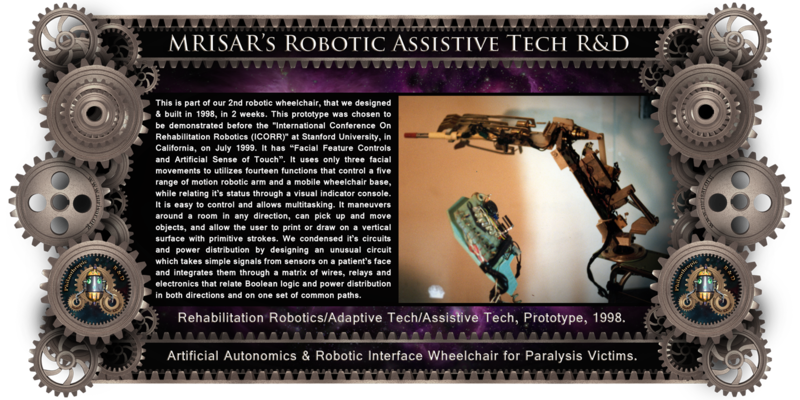 It is a "Facial Feature Controlled Robotic Device with Artificial Sense of Touch". The robotic chair above can operate a five range of motion arm, move objects, draw on paper and maneuver around a room by sensing three facial movements. 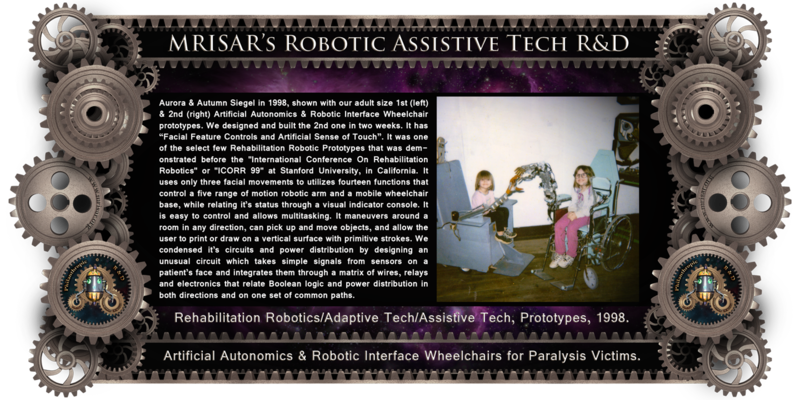 In theory and in practice the chair uses a custom designed control console and unique Boolean matrix to control fourteen separate functions. 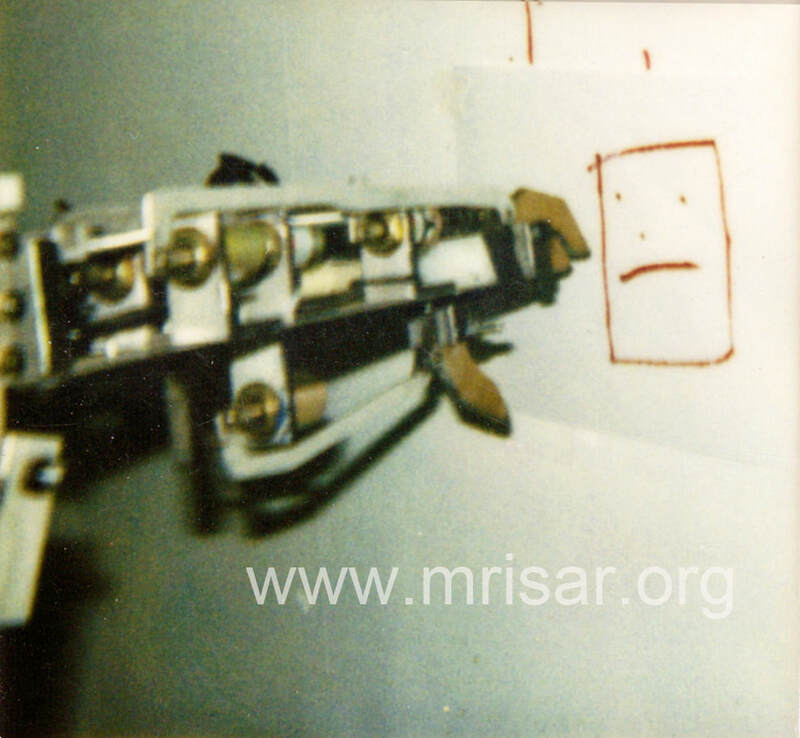 This prototype was chosen to be demonstrated before and published by the "International Conference On Rehabilitation Robotics" "(ICORR)" at Stanford University, in California, on July 1999. 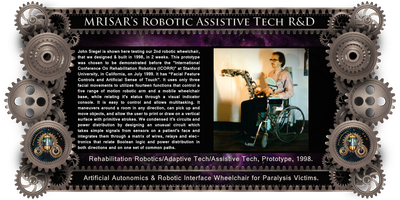 Feature Controlled Wheelchair: This experiment uses only three facial movements to utilize fourteen functions that control a five range of motion robotic arm and a mobile wheelchair base, while relating its status through a visual indicator console. This design is easy to control and allows multitasking. It maneuvers around a room in any direction, can pick up and move objects, and allow the user to print or draw on a vertical surface with primitive strokes. We condensed its circuits and power distribution by designing an unusual circuit which takes simple signals from sensors on a patient’s face and integrates them through a matrix of wires, relays and electronics which relate Boolean logic and power distribution in both directions and on one set of common paths. 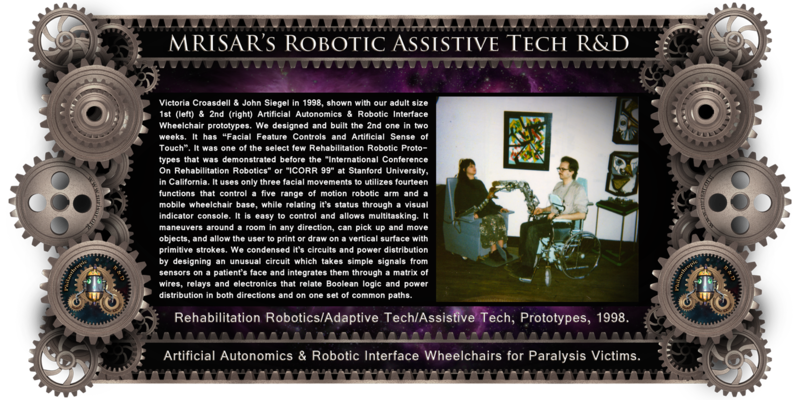 Artificial Touch; Preliminary experiment was successful. 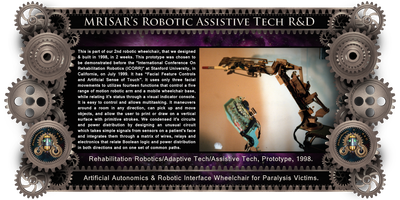 Modes; In each design the challenge in configuration is the inability of a patient to easily convey enough motion request data to the artificial system for fluid movement and quick action. To accommodate this problem, modes of operation can be designed to take care of known factors of movement relating to the surrounding environment. A mode can for example be balancing a glass of water, performing an emergency action to avoid tipping, calling for help if the patient’s vital signs are questionable, calculating climbing angles for rough terrain, navigating towards an object, shaking hands, etc. 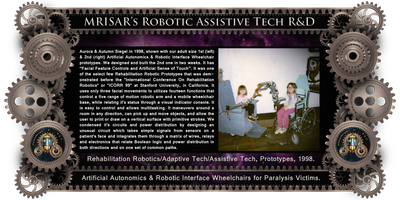 Safety; We distribute functional limitations across a robotic device to increase the chances of safe operation. For instance limits and simple logic circuits relate positions of arms and will not let them travel beyond a safe point regardless of what the main circuit board tells it to do. I believe that robots would ideally have their “Electronic Brain” spread out across the entire robots body, freeing the main boards to imply actions rather than being the total governing discipline. 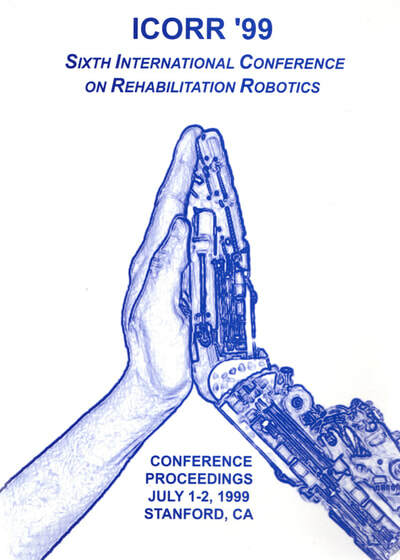 Our “Facial Feature Controlled Technology and Artificial Sense of Touch Technology was awarded, published and presented before ICORR 99; International Conference On Rehabilitation Robotics: their project was 1 of the 5 Rehabilitation Robotic Prototypes to be chosen World Wide to be demonstrated before "(ICORR)" at Stanford University, California. 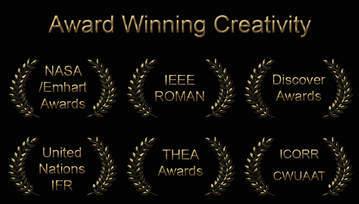 Their work was published by Stanford University, as part of the proceedings. 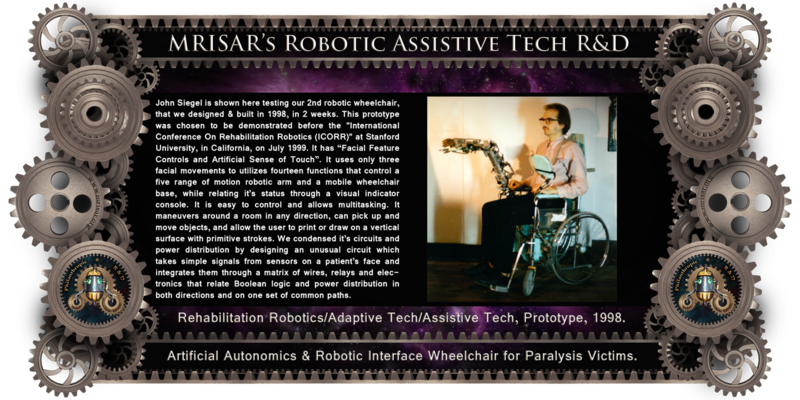 Their 1990's circa, original innovative research & development in "Facial Feature Controlled Technology" and "Artificial Sense of Touch Technology", (Adaptive Technology prototypes for the disabled), has helped pioneer those fields!